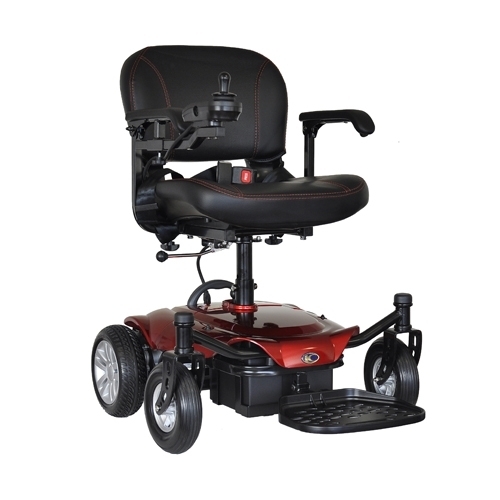 The Kymco K-Chair has been designed to provide you with an extremely portable powerchair. Drive this indoors or outdoors in complete comfort and safety. Price excluding VAT.(Incl. VAT £1,798.80) *VAT Relief available on this product. The K-Chair has a modular design which allows you to transport this powerchair with ease. It can be broken down into four sections that are easy and lightweight to lift into a car boot or storage space. The battery is wireless and simple to remove meaning that you’ll be able to charge it off-board in the comfort of your own home or via the conveniently placed port. This really comes into its own when used indoors. It has a turning circle of 19” making this compact chair perfect to get around the home. The K-Chair is just as good when used outside. It can reach distances of up to 12.5 miles on a full charge which would suit travel in your local area. The height of the seat can be adjusted and so can the armrests to suit your personal preferences. The rear wheels are equipped with puncture proof tyres to allow for maximum durability and low maintenance. By making use of the seat’s swivel action you’ll find transferring to and from the chair much easier. A fully programmable control system allows you to set the performance to how you want to drive, every time. The K-Chair is an easy to use powerchair which provides optimum manoeuvrability in tight spaces. If you like the sound of the K-Chair or have any questions regarding our mobility products, please call us on 02392 255600. Alternatively, you can visit one of our showrooms in Waterlooville and Torquay.